How far away is it from the sea? 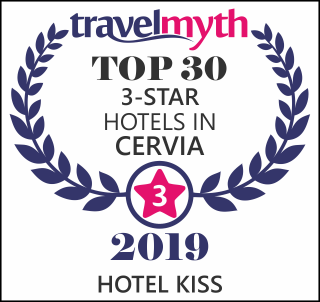 The Hotel Kiss is located directly on the Cervia Promenade. How far away is it from the pinewood? Is the city centre far away? Pinarella centre is 5 minutes away on foot, while Cervia city centre is only 15 minutes away on foot. Are you connected to the Cervia Thermal Baths? Of course! The connection is ensured by the pay shuttle that leaves with a one-hour frequency in front of the Hotel entrance. Which sports structures are available in the neighbourhood? A 7-km long bike lane: in front of the Hotel. A 5-km long “Life” path inside the pinewood: in front of the Hotel. Sports Hall with an athletics track: 300 m.
Adriatic Golf Club: 4 km. “Le Siepi” Riding Centre: 6 km. Breakfast is served buffet style in the “Orsa Minore" room on the ground floor so that the garden can be used as well. We propose daily home-made cakes and biscuits, biological jams and fresh fruit for whoever loves the sweets; those who prefer savoury food will find mixed cold cuts, eggs and toasted sandwiches. How is your menu structured? Every day a choice is available between 4 first courses and 4 second courses. There is fresh fish every day as well as a choice of home sweets that are served both at lunch and at dinner. The buffet proposes a variety of warm and cold appetizers and always fresh vegetables. Fruit is always available at the meal also at breakfast. Breakfast is served from 7:30 am to 10.00 am; lunch is served form 12:30 to 1:30 pm (at 12:00 noon for the children) and dinner from 7:30 to 9:00 pm (at 7:00 pm for the children). We have a one-year old baby, are you equipped for it? Sure, we have available all the necessary equipment: cribs, travel cots, bed barriers, high chairs and raised chairs for meals. The child usually eats around 12:00 noon and 7:00 pm; is that possible in your Hotel? And for the baby food? One member of our kitchen staff is specifically assigned to the preparation of the children’s menu. Is there is a baby sitting service? Hotel Kiss has available about 15 internal parking spots. Alternatively we have available town parking passes valid 24 hours in the entire town of Cervia. Do you accept small pets? Yes, also small-medium-sized pets are welcome because they have never had any problem in accepting the hotel rules! After their stay the room is subjected to a specific treatment.